April 3, 2019 – Norfolk County Public Works crews are busy repairing local roads after a long and unforgiving winter – but they need your help. 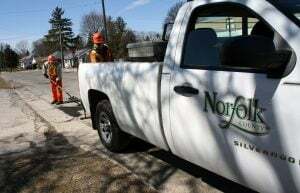 While staff identify and repair potholes as part of their routine patrols, Norfolk County residents can help by reporting potholes on area roads directly to the Public Works department. Residents can call 519-582-2100 to let customer service staff know about the location of potholes. Filling potholes happens year-round, but spring is the busiest time of year. This is due to frost coming out of the ground and the increased amount of rain that falls during March, April, and May. Norfolk County has four roads operation areas. In the spring, it’s not uncommon to have 2-3 crews patching holes in each of the four locations. 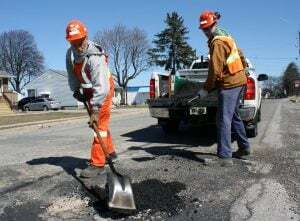 Last year alone, Norfolk used approximately 550 tons of cold patch material on area potholes.